Grit. Perseverance. Tenacity. Growth Mindset. We all know we need these qualities. We all know that students need them, too. Admittedly, each term has its own nuances to it, but when I look at them, they seem to be in the same family of characteristics that I want students (and myself) to have. But for as much as we talk about these in our schools, it sure can seem like it’s hard to find them at times. In some educational conversations, I grow tired of the same, well worn paths being covered over and over, but not with these. Even the repetition of these ideas doesn’t bother me. In fact, it’s probably what I need most. What I need to do is remember the things that are too easy to forget. Things like Angela Duckworth’s reminder that, “Grit is living life like a marathon, not like a sprint.” Things like the value of a growth mindset. Stuff that’s really simple, but when lived out causes a profound impact. More than just being told about these things we’ve all heard a bit about, stories help drive home the importance of these qualities when I begin to forget. Here are a few of my favorite videos from ESPN that remind me of the rewards for getting this right. Longshot tells the story of Stephen Curry before he became STEPH CURRY, NBA champion, league MVP, able to make half court shots look routine, king of the basketball world (at least for a time, for some). He’s great now, but what I love about the video is the way that it focuses on Steph’s struggles as a young athlete. I have two favorite sections: one about breaking down his shot as a young shooter and one about what his coach at Davidson saw in him. I love the idea that the thing Curry is most famous for now was once his weakness. That’s a powerful message for students (and for adults) to hear. I also love the way Curry’s coach talks about what he saw in Curry’s game; it’s a powerful reminder of the power we posses as educators to build others up, even when some don’t see potential in students. Drive tells the story of Richie Parker. He’s not an athlete, but he does work for Hendrick Motorsports. What makes Richie unique is his drive to let nothing stop him from doing what others can do. Also, he was born with no arms. This video is great to put me in my place when I start to think that life is hard. Certainly there is a time for that, but it’s not a place where I want to dwell. Parker’s story, attitude, and grit push me to be better for myself and others. It’s worth mentioning that we can really pigeonhole the whole conversation by exclusively likening it to these sorts of “athlete who overcomes” stories, but I think there’s some real value to having these stories out there. They resonate deeply, and they’re a great entry point into the conversation or into a deeper version of it. So I hope these are useful for you or your colleagues or your students. Really I hope they are useful for all of those groups. We’ve all given a lot up until this point, but our students deserve the best as we finish out the semester. How will you inspire yourself & others to finish the year with as much excitement as you started? 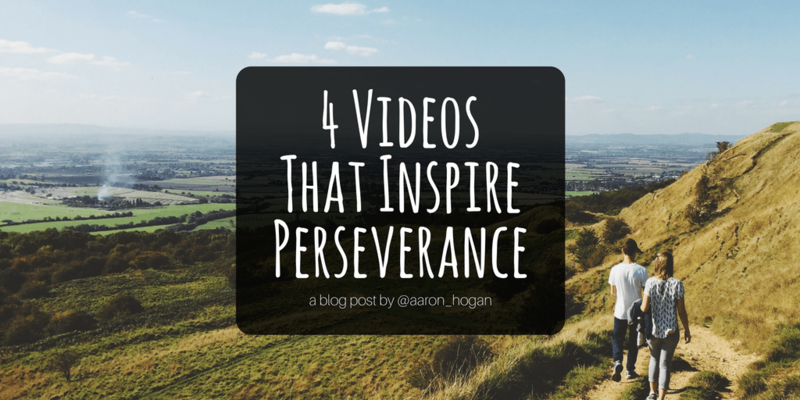 How can you use these videos in your classroom or on your campus? What are the other videos that are worth including alongside these? What will you do to help students and teachers finish the semester strong over the next few weeks?